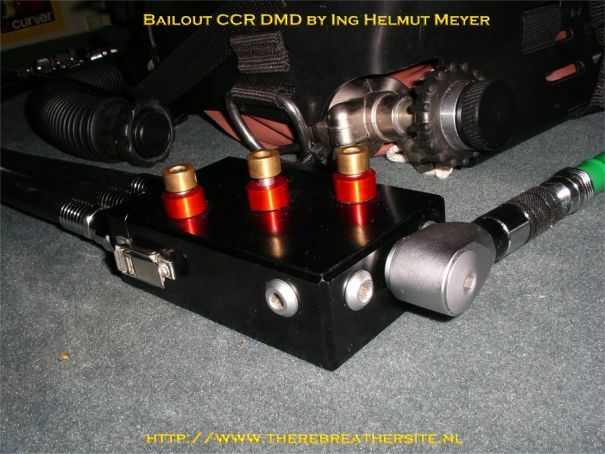 This page is added to my web to add some ideas on how to build a bailout rebreather. On my web you can find several DUAL Inspirations that offer a integrated bailout. For many people diving the Inspiration building a Dual or Twinspiration is not attainable due to the costs. The obligatory bailout cylinders are often experienced as bulky and makes diving less comfortable. Also there is the consideration, do you want the backup system worn on the back, or on the chest. 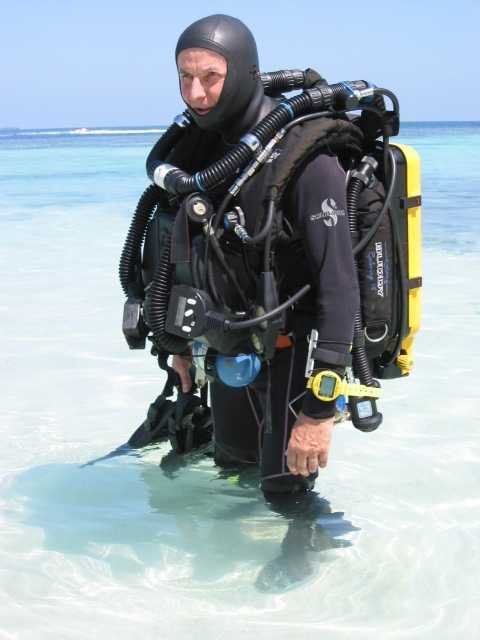 On this page you will find some solutions to this problem assuming the Bailout rebreather is worn on the chest. I would like to receive your thoughts on the concept and arguments pro and contra on these designs. 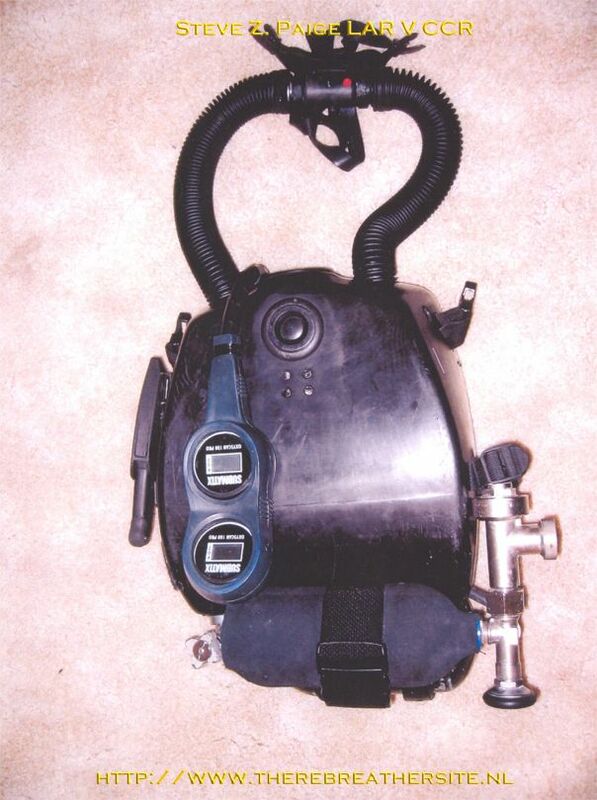 He used the Italian Castaro C96 oxygen rebreather. The working principle is based on a Kiss valve. Manual addition is possible too. 2 P-Ports one for ADV or the secondary pO2 (VR3), the other for the Oxygauge. Another solution is built by Ing. Helmut Meyer. 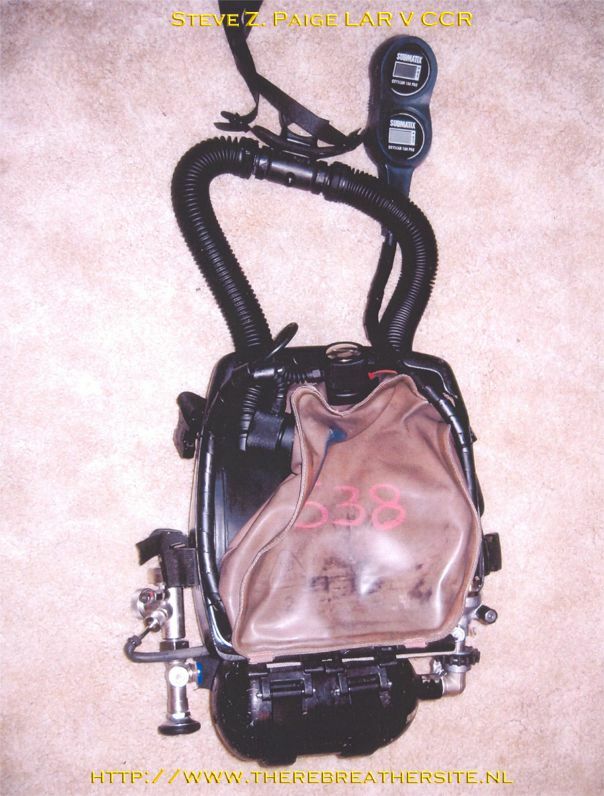 He converted a Dräger LAR VII to be used as a bailout rebreather when diving the Inspiration. The unit is built extremely nice and is operated as a MCCR. 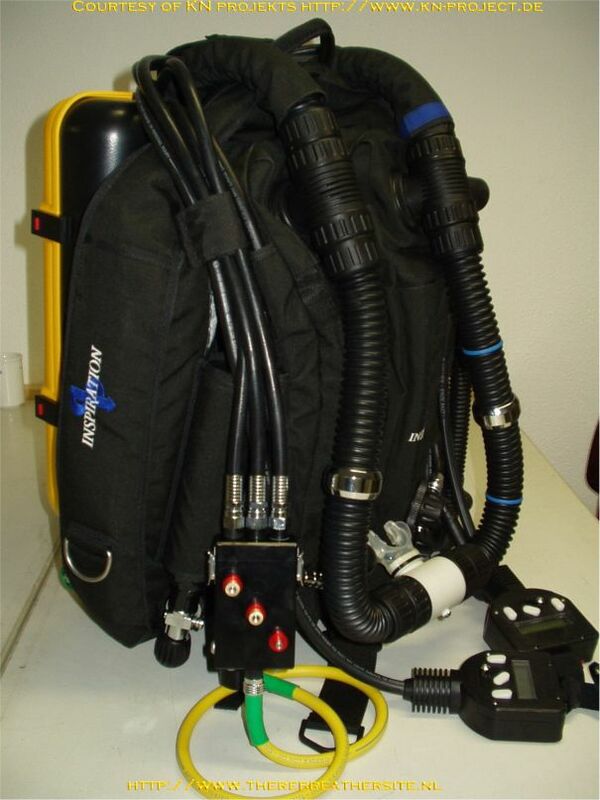 Here we see the LAR VII modified with DMD - dynamic mix device = pneumatic to produce any air/tmx/O2 - mix during the dive. The gas is added to the loop by means of a P-port. The hoses are equipped with quick connectors. Here you see the DMD box attached to the inboard gas supply. For deep trimix dives the DMD box is attached to three separate tanks, which are mounted outside of the Inspiration. The buttons of the DMD. c) Use DMD and adjust LAR ppO2 to appropriate value i.e.1,3 bar – possibility to continue your dive for next 3 hours. DMD operates completely manually. 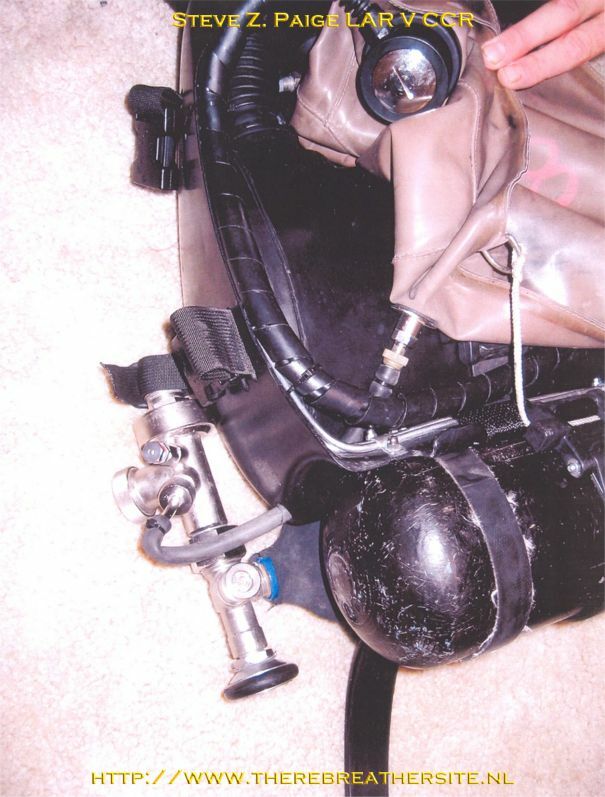 It is to be used for bailout - which means usually not used at all during a normal dive. No need for complex electronic configuration, but ALL gas mix used by the Inspiration with the same data to be used. Completely the same dive could be done by using the LAR bailout CCR. It is absolutely necessary to be trained on manual ppO2 control, which is already available with the Inspiration. At the beginning of the dive at say 10m or 20m - before actual decent - together with the other device the functionality of LAR / DMD need to be checked. 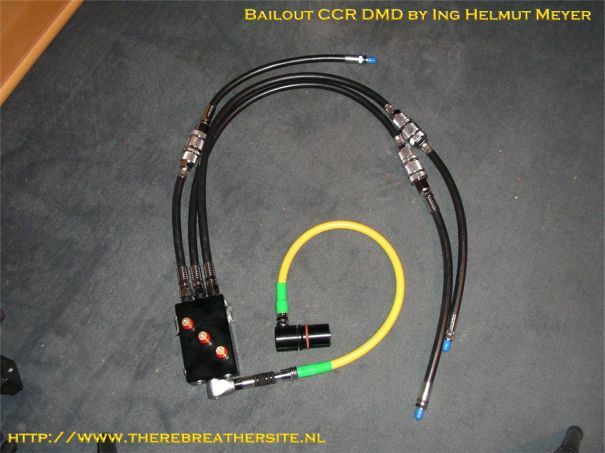 Rebreather switch to LAR (refer to A.) / LAR Trimix diluent used / all control buttons operate. ok => switch back to Inspiration / VR3 ExtppO2 switch OFF. Deco calculation of LAR VR3 with fixed setpoint / Closed CCT mode. C. ... how do you maintain a proper pO2 during the period the LAR is not used? During the period the LAR is not used an absolute proper ppO2 is not needed. The LAR is filled during descent with trimix diluent – that’s all. No measurement / no ppO2 control of the LAR when not used. Minimum depth has to be secured dependant upon mix; for example tx7/69 breathable from 20m+. There is sufficient gas in the loop. You care for it during descent. 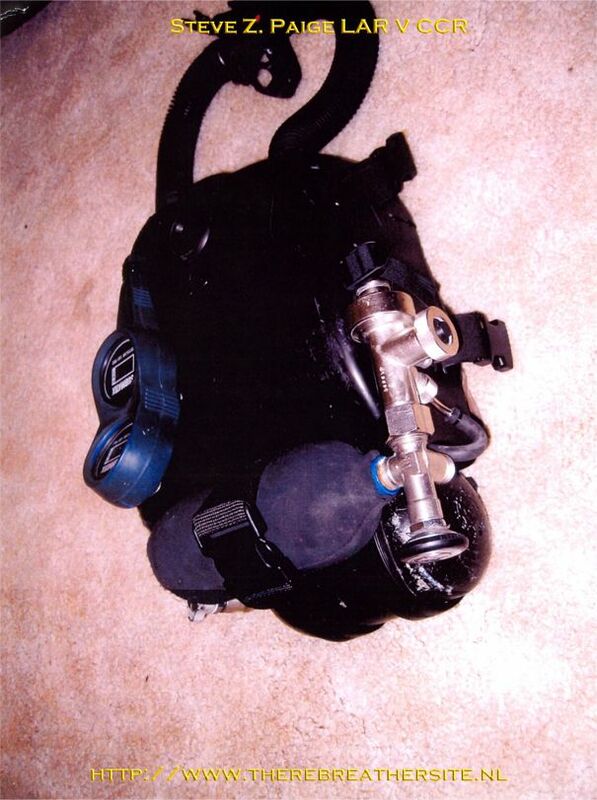 During descent appropriate trimix diluent is to be added into the LAR loop / "normal" breathing bag volume, i.e. 5 liter incl. scrubber. At 80m / 0,63bar ppO2 – is enough for the first couple of breathes. Except test before actual descent (refer to B.) the LAR loop is not used. Resultant there is NO preheating of the LAR scrubber at all. I know DiveSorb effectiveness in 5 degrees Celsius water temperature is reduced during first 5 minutes of use. I have no data of the Co2 level in such circumstances. Exactly - no stage tanks aside. 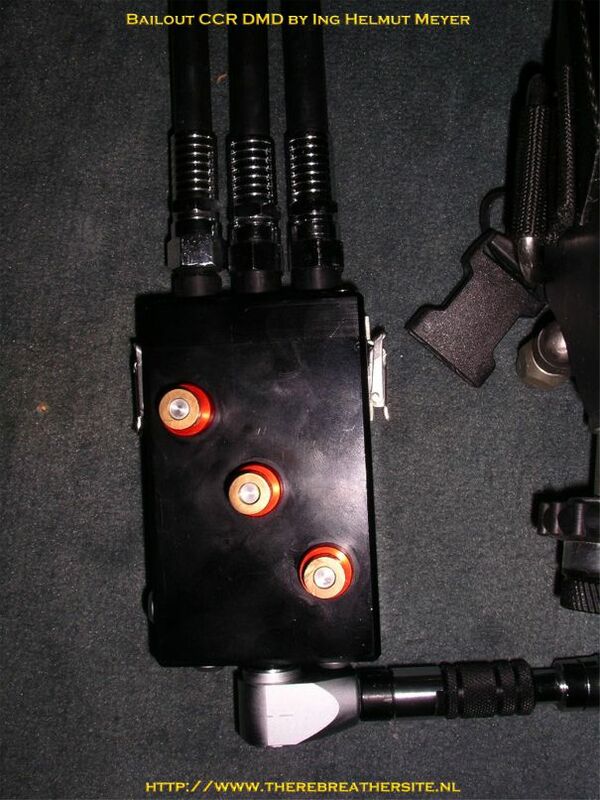 Yes there is a VR3 connected to the LAR by P-connector. Also there is a possibility to connect a second VR3 or another ppO2 monitor. Installation of a 3-sensor set is planned for more security.. The third Bailout CCR is made by Steve Paige. 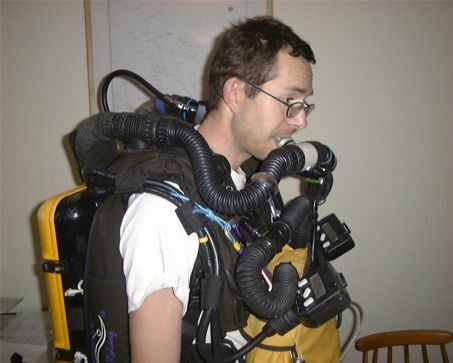 He made a beautiful bailout rebreather. The concept is simple and effective. 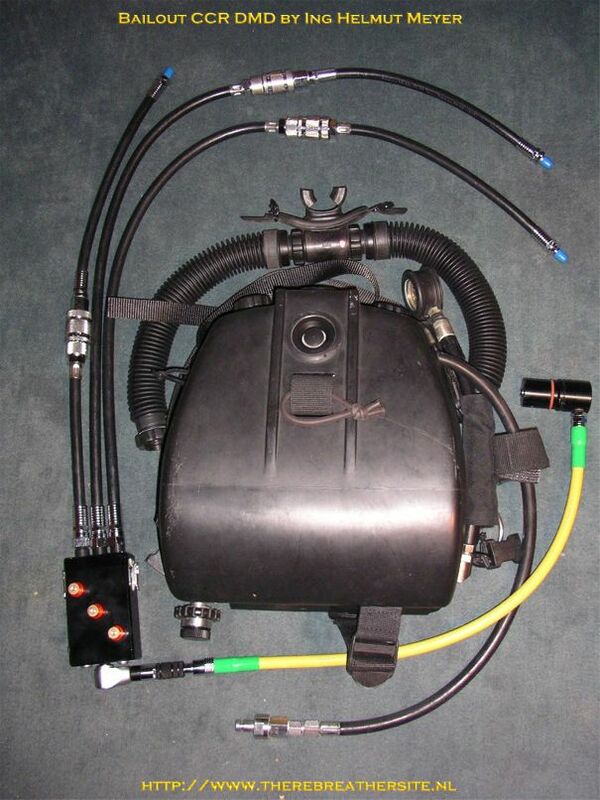 Steve managed to build a very reliable backup or main rebreather in full CC mode. The basis was the LAR V. The unit differs from Helmut's unit because a constant mass flow valve is added. The CMF is originally from a RG/UFM and has an adjustable oxygen flow of 0.7 - 1,1 ltr/min. Another valve is used for the diluent side but only used as manual bypass valve. The oxygen addition valve is clearly visible. The hose runs direct into the counterlung. Here the connection to the counterlung can be seen.